Middle School students begin their day with Assembly in which one student opens with a prayer, a second student reads the Gospel, a third student introduces the speaker for the day, and a fourth student delivers a speech. 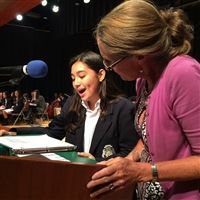 Assemblies are intentionally planned moments designed for instilling confidence through public speaking and providing the opportunity for students to deliver a prepared presentation. Through reflection, these experiences reinforce citizenship and prepare students for their Total Formation Panel Presentation. Parents and visitors are welcome to join assemblies on any given day.